I leave Camp Carnelley’s with a heavy heart. It reminds me a little of Kariba and I don’t feel like I’ve stayed long enough. Time is short though and today I head back towards Nairobi and turn off, bound for one of the greatest shows on earth… the wildebeest migration in the Masai Mara! The journey down to Narok is straightforward and on good roads. Narok is a local African town; full of life with the comings and goings of daily safari operators. It’s also the last stop before hundreds of kilometers of absolute wilderness so I fill up with diesel and grab a few essentials before my three day camp in the bush. I also manage to find a gas cyclinder and new regulator to fit my two plate stove, which I haven’t even cooked on yet. I see an neat and official looking man open the door and get down from the steps. He must be guy in charge on the bus. “What the hell were you trying to do, overtaking me whilst I was turning!”, I shout through the dust with my hands in the air. He shouts back at me and says I shouldn’t have turned. There’s not point arguing such a stupid response. I do a quick check. The windscreen is smashed but intact, my driver side window is completely out, my door and the area at my feet have caved in and has squeezed my legs against the gear stick… I’m bleeding. I can feel it on my face and neck and look down to see it running down my chest. Suddenly I’m surrounded by local bus people. I feel hands prodding my head and reach up only to be given a bloody tissue by one helpful mama who’s trying to mop up the blood on my head. The man in charge from the bus comes over and tells me that he has phoned the police and that I should go to hospital. I want to stay with the Beast. There is no way I can leave it here, with it’s windows and windscreen smashed out, and expect to come back later and find anything left. I have heard horror stories of local people taking things from crash sites before the bodies have even been taken away by ambulance – I will be cleaned out. Crap man! What the hell do I do now? Bus man is telling me that he will get a taxi to take me to hospital. 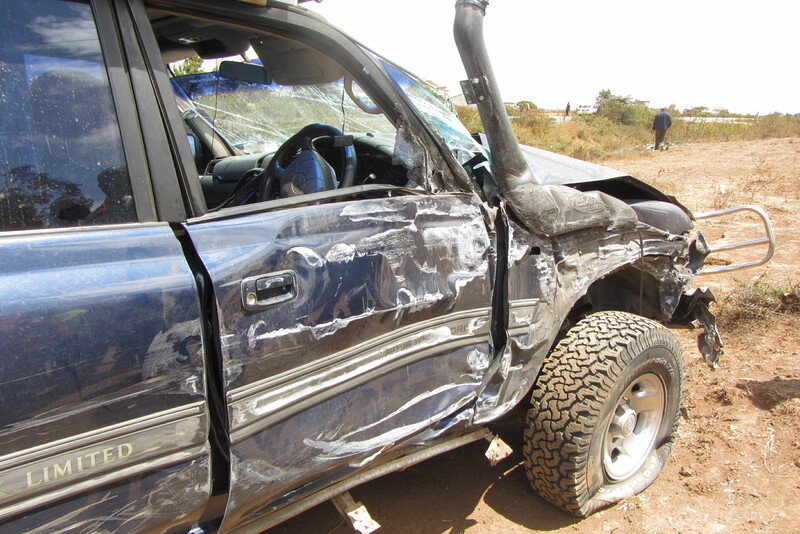 There is no way I’m going to the local hospital in god-forsaken Narok! I’m 150kms away from Nairobi, how long will it take an ambulance to get here? Do I need an ambulance? I check my head. There is a massive bump on the right side, probably hit the window or door… As far as I can tell, it’s the cut on this bump that is bleeding, and after a quick pat-down, I realise everything else is ok. I try to phone my friend Boris in Diani to ask him what I should do but he is on a fishing trip in the middle of nowhere, so I’m not holding out too much hope that he’ll get back to me anytime soon. Maybe I should phone Lovat? Then I remember that Lovat had to bail Alex out of trouble the day before. 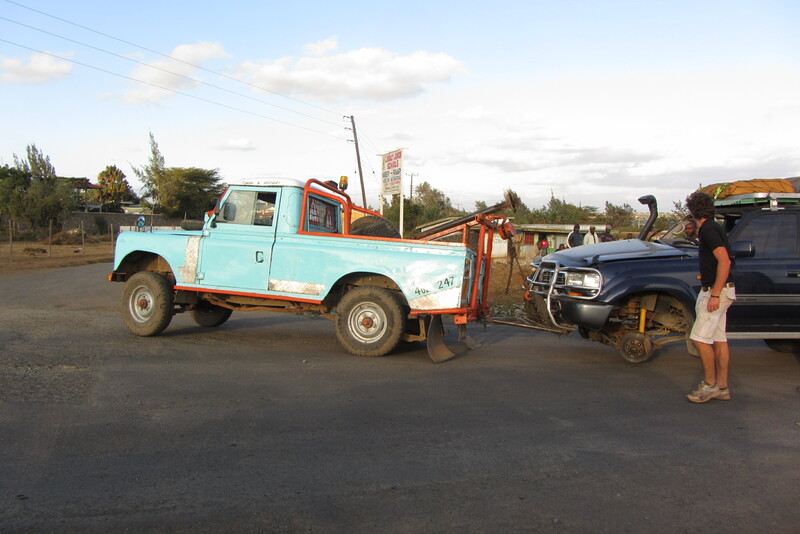 He had driven to Narok to rescue Alex’s safari truck with a bust gear box, and recovered it all the way back to Naivasha… He’s the last person I want to inconvenience. Luke seemed like a sensible guy with lots of contacts and, as he’s the last person I was in contact with this morning, I decide to call him in Naivasha and see what he thinks I should do. “Luke, it’s Shara from last night. I’ve had a bit of an incident with a bus and don’t know who to call or what to do”. Luckily I have all my paperwork in a bag just behind my seat and so I get my insurance papers out and call the company in the UK. They clearly aren’t much use but tell me to call them once I get to hospital. 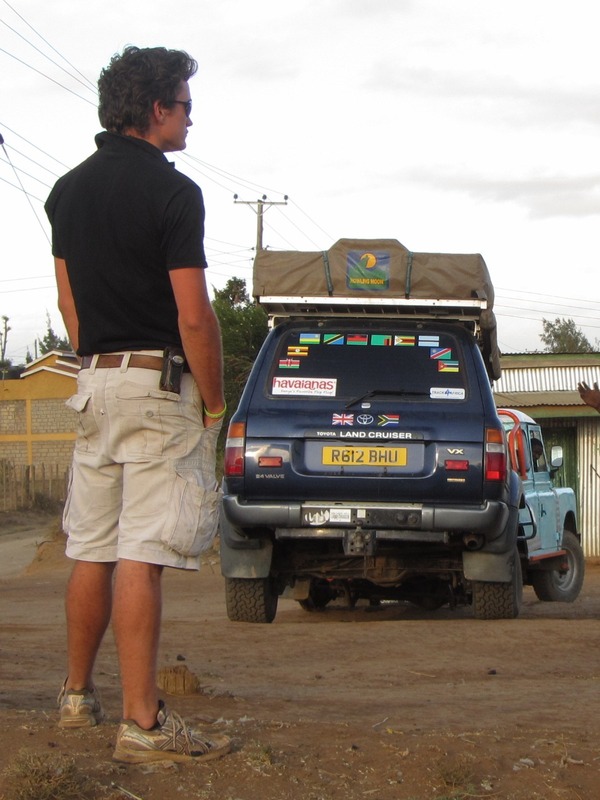 I gather all my belongings in the front of the Beast and shove everything I can see, everything from the glove compartment and under the seats into a cotton bag, before phoning Mike Diesbecq in Naivasha, He tells me Luke has left and is on his way. A well dressed mama comes to my window. She puts her hand on my arm and tells me that she is the owner of the farm next to us and that she will look after me. She shows me that she has posted her three sons around my car to make sure that they keep an eye on things for me. She asks if I want to go to hospital and that she will take me and her sons will stay with the car. I tell her I’m ok and that my friend is on his way. I have another little cry. I get a text from Luke to let me know that he has managed to get hold of a friend who lives in the area and they are sending a mechanic to me as soon as possible. I decide to get out the car and have a look around. My door is completely crunched in and there’s no budging it, so I climb over and get out the passenger door. 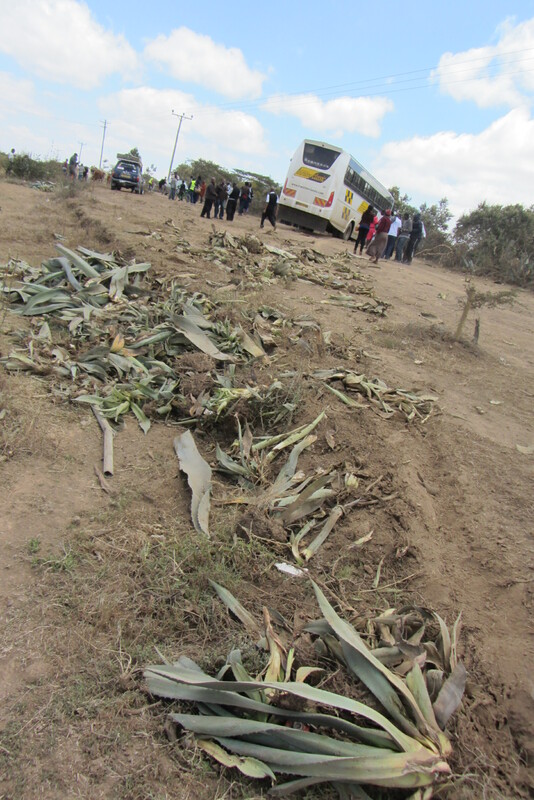 I take photos of the poor Beast, the damn bus, and the carnage from the point of impact to where the vehicles both stand; strewn metal, severed plastic and crushed aloes. The Beast is wounded… my door and front panel totally crumpled, bonnet buckled, front drivers wheel completely flat. All I can think about is the fact that my trip, that I’ve spent almost two years planning might be over. The police arrive after an hour and tell me to go to hospital. I tell them I’m waiting for my friend and don’t want to leave my vehicle. They put me in the back seat of their car and take a statement from me. Jack the mechanic arrives with a small team and they go to work assessing the damage. They remove the flat tyre and put my spare one on. Not long after the police arrive from 8kms down the road, Luke arrives all the way from Naivasha – he must have done some serious low flying to get to me this quickly. I run over, give him the biggest hug and have another cry… (that’s the last one I promise). He checks my head and we go over to the cops who are getting a statement from the bus driver. The police want me to come back to the police station in Narok and they want to keep the Cruiser in for observation. Luke argues with them. As no one has been injured, we should be allowed to recover the Cruiser back to Naivasha instead of leaving it at the police station. He’s sure there will be nothing left of it if we do. The cops agree to us taking the Beast back that same day, but I need to go back to the station in Narok to do the paperwork. I walk over to Kamal, one of the farm lady’s sons and quietly give him some money for the family to say thank you for their kindness. He looks at his fence and asks he for more money… I explain that I’m not liable for that damage. It’s the bus that has destroyed the fence, and therefore he should take that up with the bus company. After replacing the flat tyre with the spare, Jack the mechanic starts the car and actually drives the Beast out and back onto the road. There’s talk about driving the Beast all the way back to Naivasha…! Really? Almost immediately, the Beast comes to a halt. The steering arm, obviously hanging on my a thread, has snapped and has given way, leaving the steering wheel spinning freely. 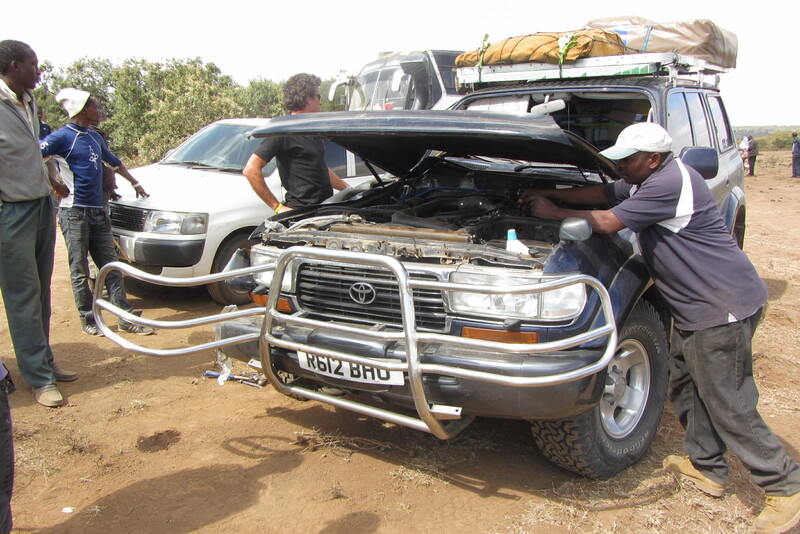 We manage to get a local tow truck out from Narok pretty quickly and leave Jack to sort that out for us whilst Luke takes me and Kamal to the police station in town. The cop shop is up some back street over 4×4 rocky terrain. It’s a tiny corrugated iron hut no bigger than 5m by 3m and seats 2 policeman and their desks. Shelves hang onto the walls for dear life. There must be over 20 years worth of paper work, all yellow and bundled together, stacked high to the ceiling. The shelves bow under the weight. After about half an hour of photocopying, signing and stamping, I have my ‘abstact’ and we are free to go. We head back towards the main road and meet the recovery truck as it’s coming into town. The Land Rover is crawling along at 2km/h with it’s front tyres literally off the ground under the weight of the Beast. It’s a funny sight, Luke and I had to laugh! 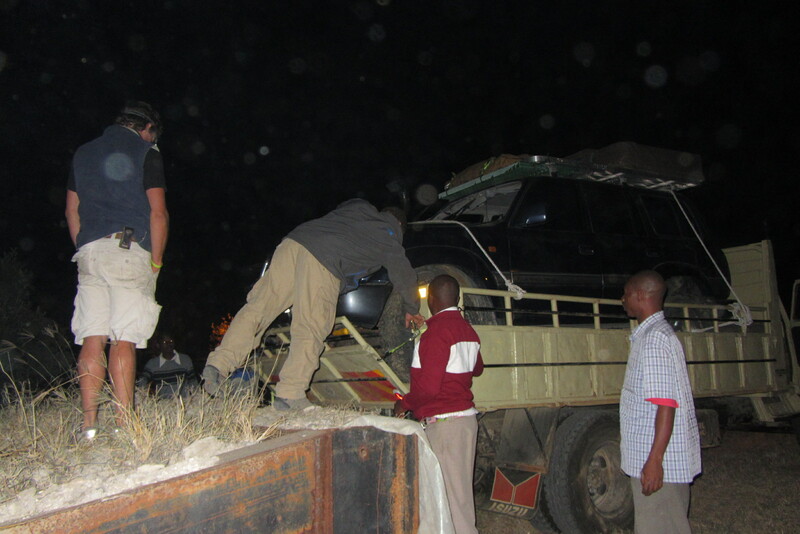 There is no way this vehicle is going to get the Beast back to Naivasha, 130kms away. We park near the petrol station and immediately draw a crowd of drama-hungry watu. As the window is gone and the Beast doesn’t lock, there is still the very real possibility of things growing legs, so Jack the mechanic is posted on the one side of the Beast and I watch the other. Luke heads off down the road to a group of trucks to look for a suitable one we could load the beast onto. He comes back with a driver who is willing to do the trip for KES 25,000 (£180). One logistical problem, how the hell do we get the Beast loaded onto the back of the truck? Luke decides the best way would be to find an embankment high enough, park the truck underneath and roll the Beast off the embankment. Just our luck there is a place not far out of town with something that might work. Luke had negotiated with the recovery truck driver on a price of KES15,000 but just as we are about to load the Beast, the driver wants another KES5,000. Typical. It’s getting pretty late and all I want is to get this Beast back to Naivasha. Despite Luke’s 15 minute rant at this guy, he doesn’t budge and I end up paying him KES20,000 (£150) for towing 10km. We find the spot and, just our luck, the embankment is the perfect height. 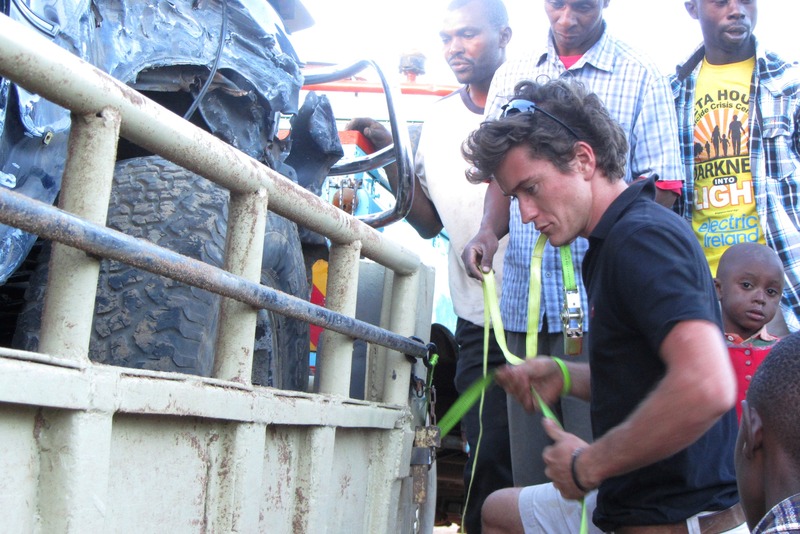 With the truck in position, an audience of watu, Jack driving, Luke yelling in Swahili, the recovery vehicle backs up and rolls the Beast onto the truck with few problems. It’s a snug fit and the Beast is slightly too long for the back so Luke and I head back into town to buy chains and locks to secure the tailgate which we can lift to around 45 degrees. With the Beast firmly in place, Kamal (the farm lady’s son) offers to ride with the truck to Naivasha to keep an eye on my stuff. We give them some money for dinner on the way and Luke and I head off back to Naivasha. It’s dark now and we stop at each road block. At each one Luke tells the police to expect the truck and to let them though. 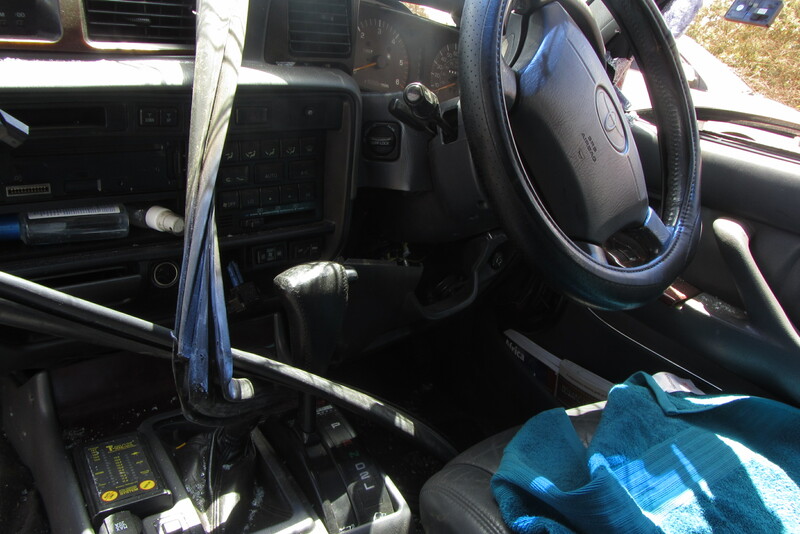 I have also given the driver a copy the accident abstract and a copy of my driver’s licence with a signed note saying I have authorised the recovery of my vehicle. The last thing I want is for the damn thing to be held up by the police. I’m in contact with Mike the whole way back to Naivasha and he’s waiting for us on the road, it’s 9:30pm. We go to his neighbours Andy and Fleur and wait for the truck to come in. It’s after 11pm when we get the call from the truck driver to say he’s down the road. Another stroke of luck, Mike has a ramp on his flower farm, built for loading rally cars onto trucks – and that’s where we will unload the Beast. The tailgate is slightly higher than the top of the ramp but we prop it up on bricks. The Beast is still able to drive forwards, but without the steering wheel, the guys have to use poles and lever the front wheels to turn it wherever necessary, a slow and labourious process. We cover the Beast in my tarpaulin and I give Kamal some more money to say thank you, he asks for more, so Luke give him the jacket he’s wearing. Mike lives in a big old farm house and has plenty of space to take me in for the night. He offers to have me stay for as long as I need. What a day! And what amazing people these guys are. No matter how many times I thank him, Luke might never realise the extent of my gratitude. I am humbled by his kindness; coming to the rescue of someone he barely knows. I guess, after living in London for so many years, with everyone far too busy with their own lives, I just didn’t expect that someone would go to that extent to help me out. I could so easily have been stuck on the side of that road for hours with no help, possibly spending the night in Narok (where there are no muzungu hotels), potentially having all my stuff stripped from the Beast, I might even have slept in the Beast until I’d sorted myself out – that would have taken days! But that wasn’t the case, thanks to this legendary and kind person, who shrugs the whole ordeal off like he’d do it all over again tomorrow. Luke Davey, you are a saint! Absolutely exhausted and too tired to even contemplate having a shower to wash my matted bloody hair and body, I go straight to sleep. wwwwow, crazy! glad you made such great friends! can’t wait to continue reading about your adventures!